Kathy Aiken of Bloomington was chosen as the winner of the One World Enterprises Cinnamon Roll Bake-Off on Jan. 13 after a live judging event. Aiken received the grand prize award of $500 in cash, $500 of Hive Honey Money, and a $500 charitable donation to the Community Kitchen, the nonprofit of her choice. In December contestants submitted their favorite cinnamon roll recipes online. The contest was open to the public, and each contestant received $15 of Hive Honey Money, which can be used at the Hive restaurant that will open this spring at 10th and the Bypass. There were 25 entries, and all contestants were invited to the One World KitchenShare facility to present their baked goods to the judges. 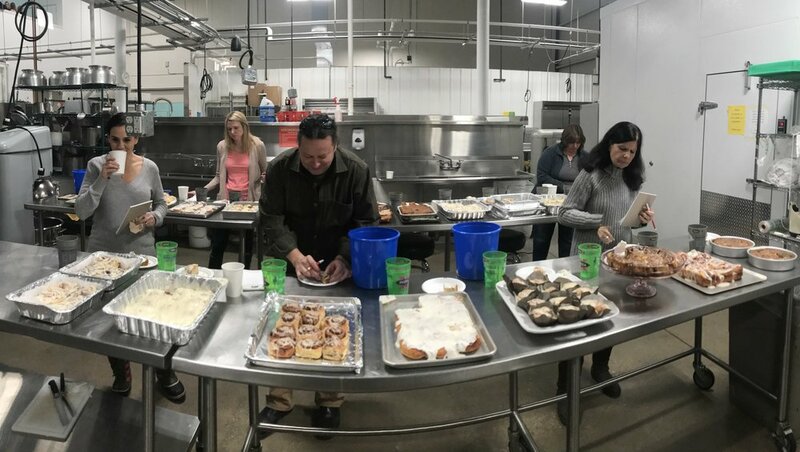 The judges were One World owner Jeff Mease, H-T food columnist Carol Kugler, Bloomington city councilwoman Allison Chopra, Monroe County Judge Mary Ellen Diekhoff and Anne Bono, with the Greater Bloomington Chamber of Commerce. Aiken said she has been baking since she was a little girl, when her grandmother taught her. She uses ingredients that she trusts, including King Arthur flour and Penzey’s Spices, and measured by weight for this recipe, instead of by volume. “That made a big difference in the amount of flour, by almost another cup,” she said. This particular recipe had the unusual step of pouring cream over the prepared rolls just before putting them in the oven. Aiken thinks that added something special to the texture. All contestants presented their finished product to the judges and were able to sample the other creations, along with guests at the event, after judging was finished. Each cinnamon roll was unique, with some including ingredients such as bourbon and coffee. The judges evaluated the rolls based on appearance, texture and, of course, taste. The People’s Choice Award went to cinnamon rolls created by Karla Lewis of Bloomington. Everyone who attended the event was asked to vote for their favorite cinnamon rolls. The contest was held to celebrate the opening of Hive, a fresh-casual concept restaurant from One World Enterprises. Cinnamon rolls will be featured on the Hive menu, which will specialize in creative comfort food for dining in or on the go.